If you really want to make passers-by take a good look at the car you are driving, then a Lexus LS may just be the right choice. 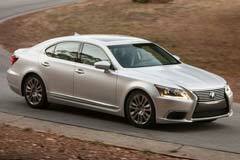 If you decide to buy a used Lexus LS you will be able to benefit from a refined and luxurious car. The performance of the Lexus LS is considered to be top quality. The active bi-xenon headlights, 19 or 20 inch alloy wheels, and a high quality navigational system are some of the things you may wish to take into account. They certainly add to this car's luxuriousness and convenience. The dashboard is nicely designed, although there may be a bit too many buttons and controls for some. Roomy rear seats, a superb surround and DVD system, and leather trimmed areas are some of the highlighted features of the Lexus LS. 2012 LS COMFORT / NAVIGATION 2012 Lexus LS 460, Nebula Gray Pearl with 94,706 Miles available now!